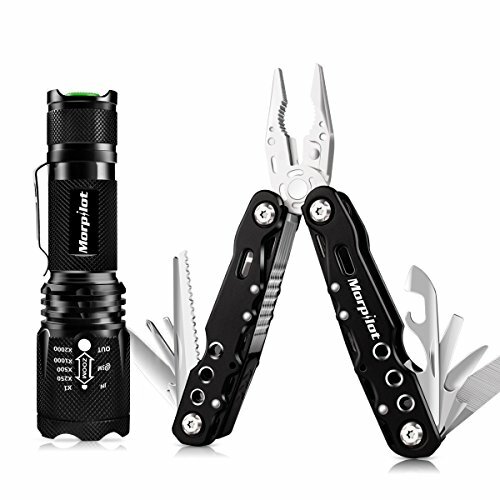 POWERFUL COMBO SET: Multi-Plier & Tactical Flashlight Set, Not only for daily use, but for survival gear, like Camping, Hunting, Survival, Emergency, Military, Outdoor, Hurricane. STAINLESS STEEL MULTITOOL: Made of hardened stainless steel, Multi-Plier can be use with a reliable high performance of twist nuts, saw branches, cut rope, cut wire, open can, bottle. MULTI-FUNCTIONAL: This practical multi-plier assembles over 14 most useful tools: spring-loaded Pliers, wire cutters stripper, long blade knife, serrated blade knife(saw), short blade knife, wire cutter wire stripper, mini flathead screwdriver, medium flathead screwdriver, large flathead screwdriver, crosshead screwdriver, nail metal file, fish hook remover, with a safe locking mechanism. TACTICAL FLASHLIGHT: 5 Modes Flashlight: High brightness, medium brightness, low brightness, Strobe, SOS. Deeply press the tail switch to turn on, half-deep press the switch to select the operating mode. Aviation grade aluminum. Waterproof IPX4. Anti-drop. MONEY BACK GUARANTEED: 30days money back guarantee , 12 months replacement warranty, Ideal gift for those like outdoor survival sports.